I have been shooting a type of “Employee of the month" for this company for a long time and recently I decided I wanted to step out and try something I had never really tried before. This time the client said he was a pilot, and wanted some shots of him with the plane he learned to fly in. "Cool" I thought "Planes are neat" We were initially going to fly to a rural airstrip and get some shots there. I had a few 580exII and a small soft box. But when we got to the hanger the weather was too bad to fly. So we decided on the next best thing. I rolled the airplane out onto the runway and I quickly set up my lighting to get a few shots with the client in the cockpit. I took several shots of the exterior of plane trying to "light paint” and then a few with my soft box inside the cockpit. After about 15 mins it started to rain so we were done. 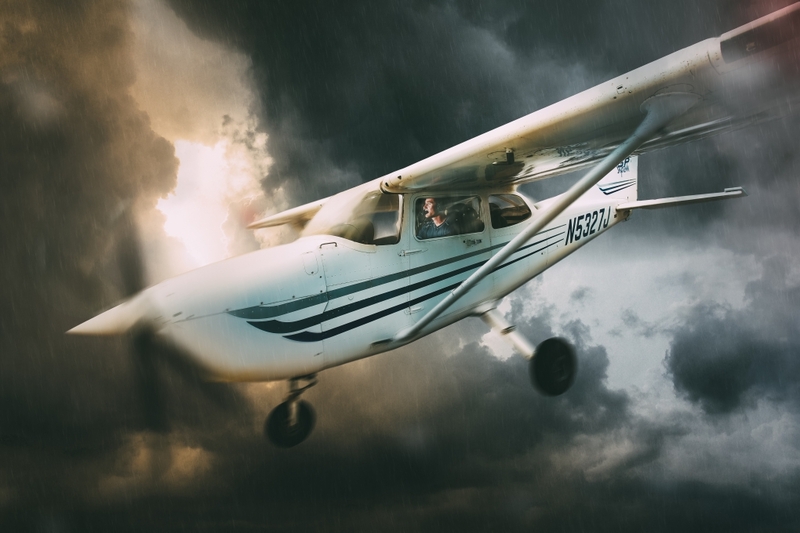 I then spent about 6 hours putting the image together with images I had of clouds and compositing rain and motion blur, The FStoppers Community was a great help in fine tuning it all! Wow! Very dramatic image! Outstanding! Aww thanks Rebecca! I've updated Exif and all that jazz. Let me know if you would like to use it, that would be dooooope! Good job on the motion blur and light in the cockpit. This is definitely a poster I would buy! Great photo! I know you made the prop look four-bladed for motion and the attitude of the plane is compositional, but just for reference, the navigation light on the right wing is always green. I loved watching this shot come together from when you first posted it! Wonderful work. Wow. Great shot. I feel a lack of speed but, maybe you didn't intend to illustrate that. Either way very intense image, really like the color.